Off and on we've been following the history and evolution of the concept of having a permanent, in-place museum exhibit at Dinosaur National Monument. The last post about this was Boyle and the First Museum. During the time that Boyle's museum was being designed and built, another effort was underway to create the long hoped for in-situ exhibit. 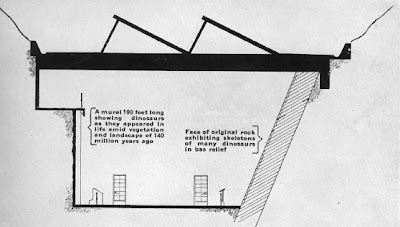 In 1930 the American Museum of Natural History in New York City, one of the world’s preeminent museums and one with tremendous holdings of dinosaur fossils, approached the NPS about working at the Carnegie Quarry and developing the in-situ exhibit. 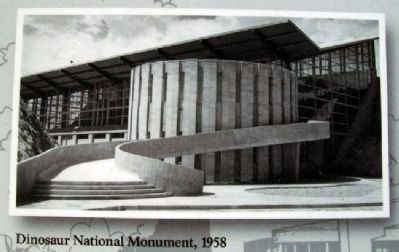 As a result of a series of meetings between the NPS and the AMNH in 1930 and 1931, it was decided that the AMNH would undertake the in-situ exhibit and assist in the development of a museum and associated exhibits at the Monument. 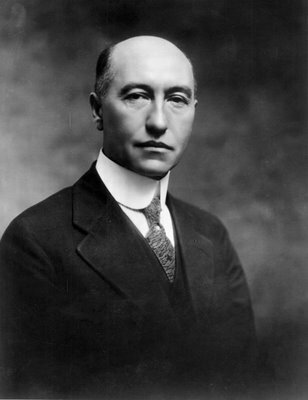 Dr. Barnum Brown of the AMNH was to be the paleontologist overseeing the project. Brown was well qualified. He was a renowned paleontologist, having collected fossils around the world and he collected more dinosaurs than anyone else in the history of dinosaur paleontology. He was certainly one of the most colorful and well known scientists in the discipline. He never lost the passion either. In his 80's Brown tried to put together a project where he would use a platform suspended from a helicopter to collect fossils from otherwise inaccessible heights on the cliffs of the Isle of Wight (3). Brown was definitely someone you wanted on your side in the search for how to get the Monument museum built. 1. The AMNH would budget $50,000 to support five of its employees to prepare the in-situ exhibit. The AMNH will have its staff at the Carnegie Quarry as soon as the excavations begin, with work starting in May 1932. The five man crew would work for three years, summer and winter, to complete the exhibit. 2. A $200,000 appropriation, over three years, would be requested from Congress for the cost of excavation, building roads and houses, and building the Museum to enclose the completed excavation site with the exposed bones. 3. 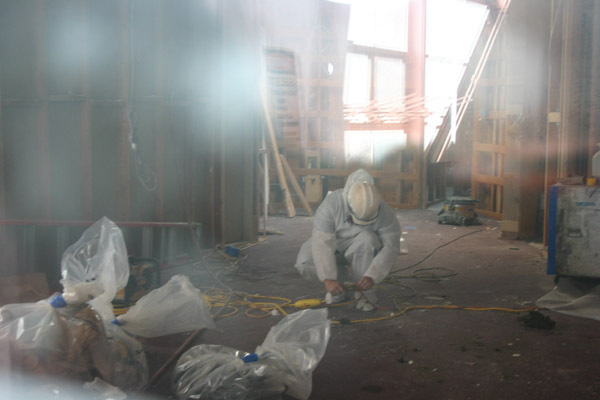 The NPS would allow AMNH personnel to use equipment, such as compressed air, and housing already on site. Anyway, after years of effort it seemed that the in-place fossil exhibit and museum at Dinosaur was finally assured. Drawings were prepared of the proposed museum building. These follow Douglass’s vision of a flat roofed building with the natural hills forming the north and south sides and large windows on the roof to let in light. A long mural, nearly the length of the enclosed quarry, was to portray the extinct Morris Formation dinosaurs and the environment they lived in. 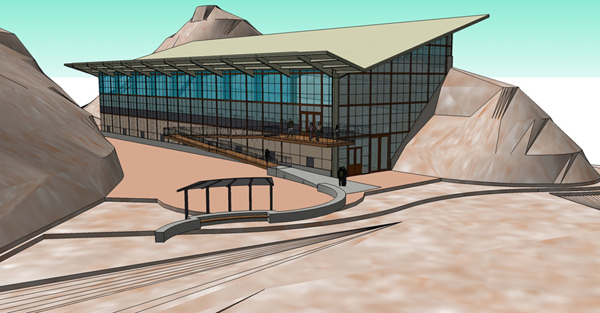 Cross sectional drawing of the AMNH version of the Quarry Visitor Center, bone-bearing sandstone on the right, with flat roof, skylights, and a 190 foot long dinosaur mural . The proposed flat roof in the 1937 drawing would probably have served as a nice surface on which to trap and hold mud and blocks of sandstone that would be weathering off the slopes to the north and south. Unless frequently cleared off the roof would have collapsed. So the building ultimately constructed in 1957/1958 took a different approach with the roof. … and he was, of course, absolutely right! Dingus and Norell (2010) is an excellent biography of Barnum Brown, chock full of stories about the greatest dinosaur hunter of all time. Much of this blog is based on R.G. Beidelman’s report Administrative History, Dinosaur National Monument. Unless otherwise noted, all quotes in this post are from this source. This fascinating report is the best summary of the history of the Carnegie Quarry between its discovery and 1956, much of which has never appeared in print. It contains abundant quotes from correspondence, newspapers, etc. and provides complete citations to where these documents can be found in the National Archives. Although it is in an unpublished internal report, it is available on-line from the National Park Service at http://www.nps.gov/history/history/online_books/dino2/adhi.pdf. It is an interesting read. (2) Brown, B. 1937. Dinosaurs on Parade. Natural History, December 1937: 505-513. (3) A. Dingus, L. and M.A. Norell 2010. 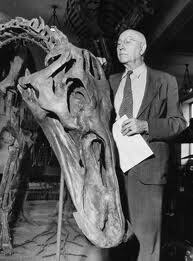 Barnum Brown, The Man Who Discovered Tyrannosaurus rex. University of California Press, Berkeley: 168 pp. M.C. 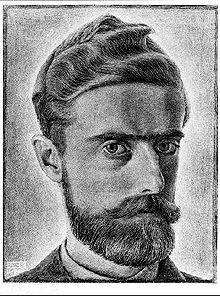 Escher was a famous 20th century Dutch graphic artist known for images that examine issues of perspective and the representation of three-dimensional images in a two-dimensional picture. 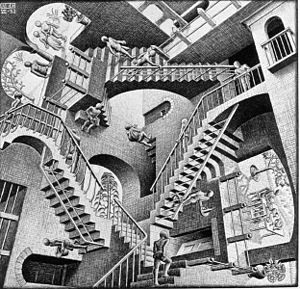 Relativity, one of Escher's most famous pieces of art. It's a picture one can hang any side up! One of his most famous works is Relativity, with its six stairways all seen from different perspectives at the same time. Technically, there are actually three sources of gravity in the drawing, each being orthogonal to the two others. Each of the 16 people lives in one of the gravity wells, where normal physical laws apply. As a result two inhabitants can use the same stairway in the same direction and on the same side, but each using a different face of each step; thus, one descends the stairway as the other climbs it, even while moving in the same direction nearly side-by-side. If this seems confusing, well it’s intended to be. You can explore this theme more on line at references (1) and (2). "This is all very arcane and mildly amusing" you might say "but what the hell does this have to do with the QVC project?" We are continuing building the framework for the indoor ramp and second floor mezzanine. The latter will extend the entire length of the building. You’ll enter at the east end, get a spectacular panoramic view of the quarry face as you walk along the upper mezzanine, and at the west end take the ramp down to the lower level exhibits. 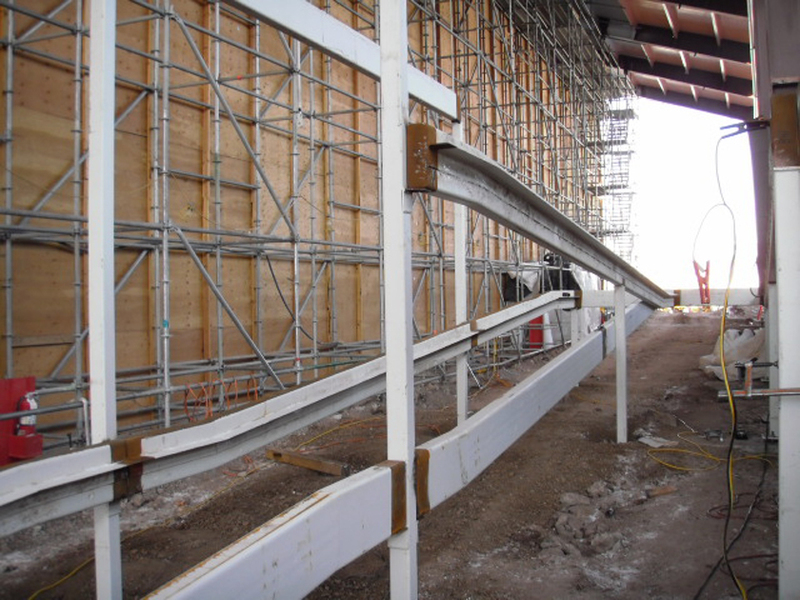 However, as can be seen in these photos, the front part of the mezzanine frame is built inside the scaffolding frame that is holding up the huge plywood box enclosing and protecting the quarry face. Um, how did this happen you ask? Before you go spouting off about “typical of government work” let me assure you that there is a method to our madness. 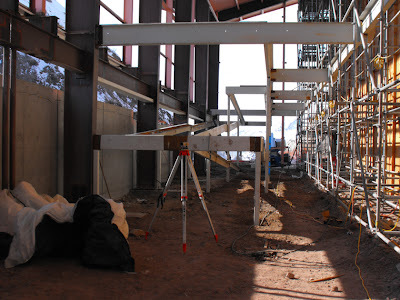 Careful readers will have noticed that what I wrote above is that we are building the frame for the mezzanine. 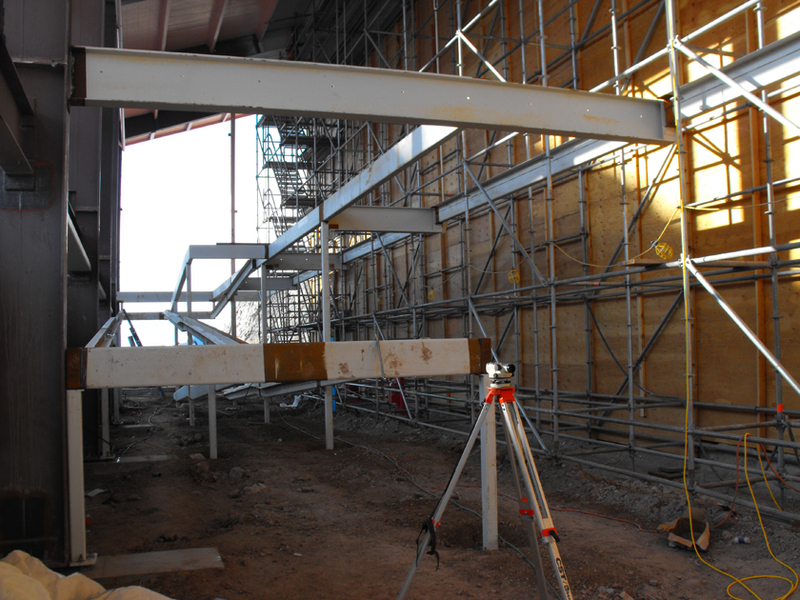 The new mezzanine is wider than the old one and will bring people closer to the bone deposit. The scaffolding cannot be partially dismantled for the mezzanine construction because the integrity of the entire protective structure would be compromised. 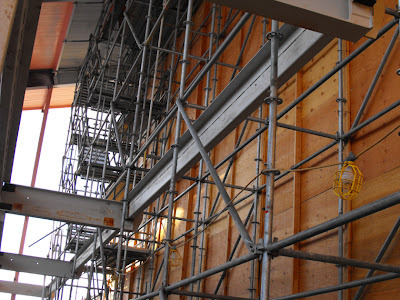 As a result, the front of the frame was constructed within the scaffolding. So the strategy is to build the framing first, including that part that sits inside the scaffolding, and then put its completion on hold until after the glass walls are completely installed and the inside of the building is protected from the elements. 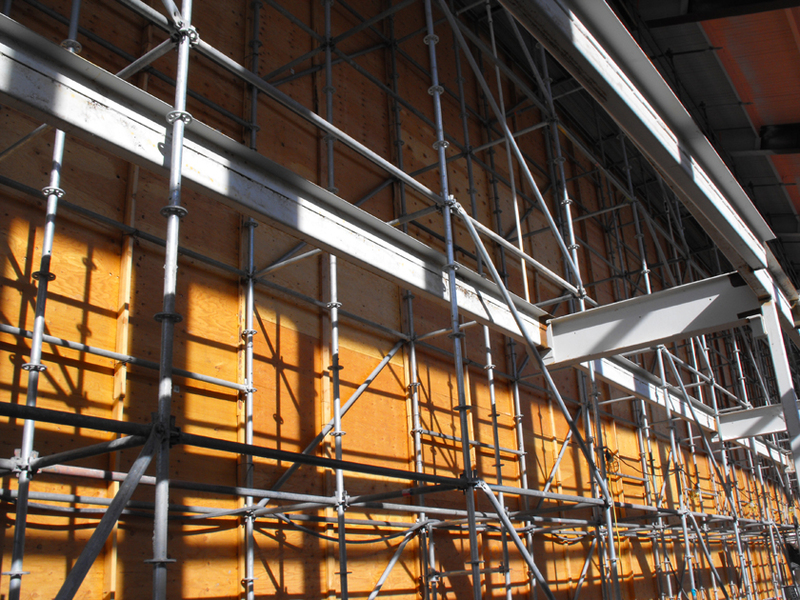 Then the scaffolding and the plywood sarcophagus will be dismantled and the decking and railing can be installed and the mezzanine completed. 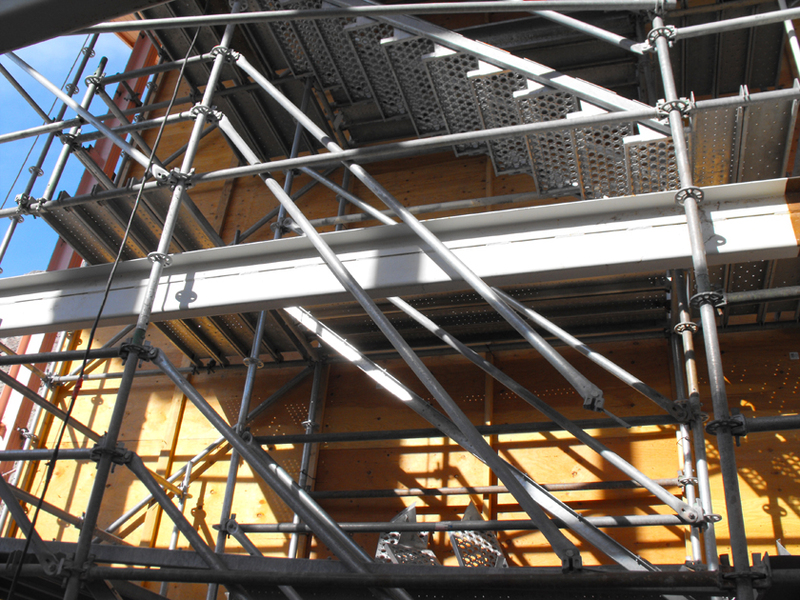 In the interim, the intertwined frame and scaffolding will just have a, well, “Escher- like” quality about it. Escher self-portrait and Relativity from references 1 and 2 below. As you may recall, constant readers, one the most spectacular, and fear inducing, problems of the Quarry Visitor Center was the east glass wall (see my previous post Inside the QVC Part III The Wall of Death Saturday, March 20, 2010). The huge glass wall on the east side of the building had pulled off its foundation and was hanging by the welds at the top. 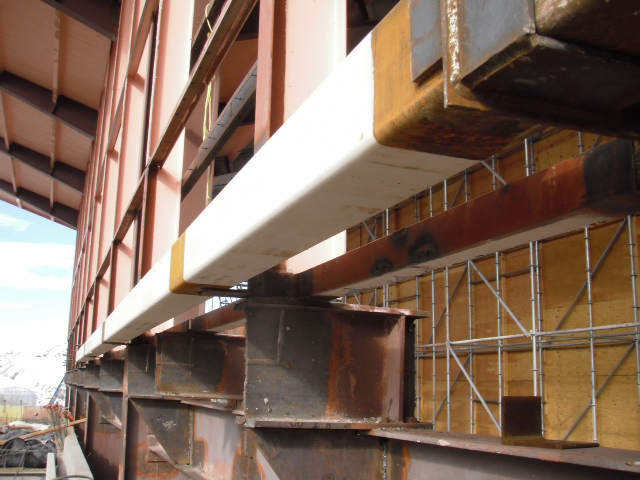 When the vertical steel beams of the east wall pulled off the foundation, the attachment bolts and the concrete of the foundation were irreparably damaged. 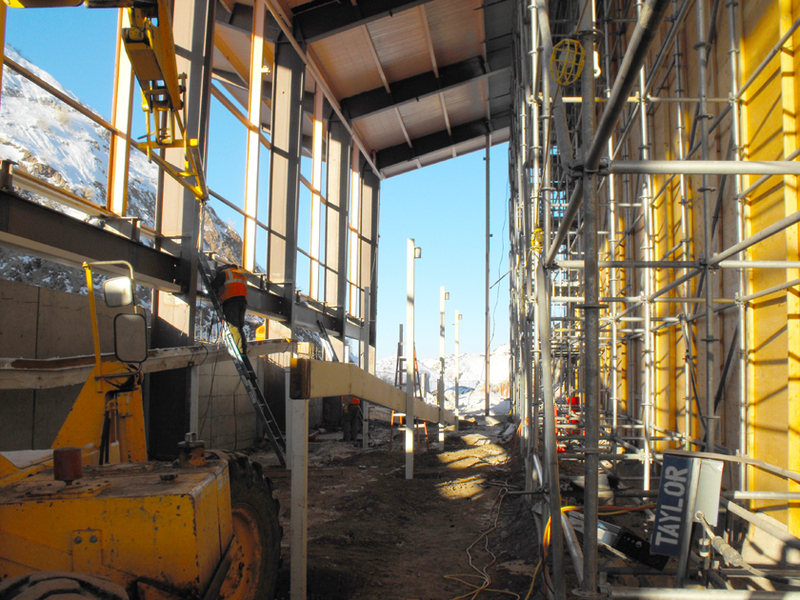 The beams were removed in order to get the 28,000 pound crane out of the building. 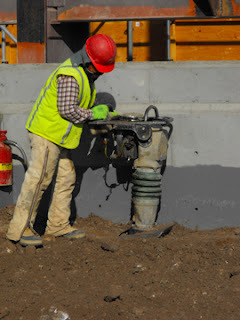 The repair of the foundation was scheduled for later in the project. That time has finally arrived. Repairing the serious damage to the bolts and concrete was more than just patching some cracks --- major surgery was required. 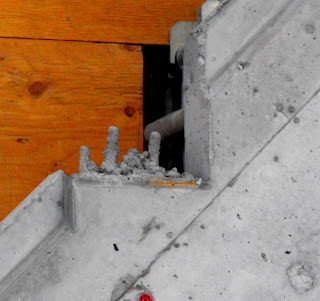 Concrete saws cut away a large area around each damaged beam support. Plywood forms were built and put in place, threaded steel rods positioned, and concrete poured. 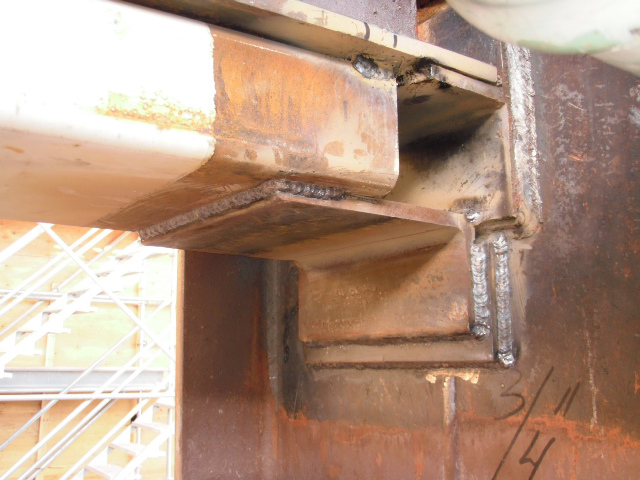 The three replaced support areas, easily visible, will provide new and stable bases which the steel beams will be bolted to when they are reinstalled. 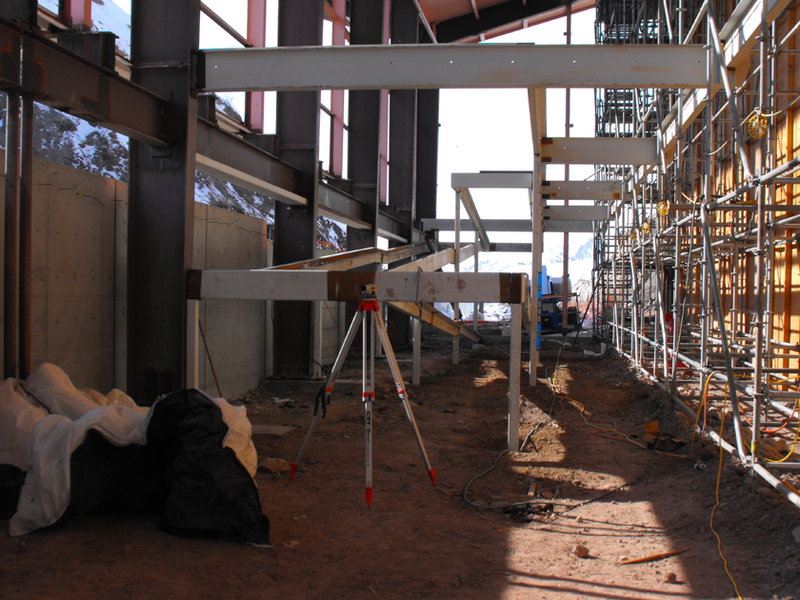 Once the beams are in, the glass which will form most of the wall can be put in. For the first time in decades one will be able to stand by this magnificent wall of glass without thinking about Damocles. For those of you not familiar with it, Big Love is a HBO hit original series focusing on the travails and tribulations of a polygamist Mormon family living in the Wasatch Front and their extended families in the polygamist compounds elsewhere in the state. So, by virtue of its storyline it is a very Utah centric series. In tonight’s episode, Bill Henrickson, the main male character, is chatting with a close business associate who tells him he is taking off a few days to go ice fishing at Flaming Gorge Reservoir. Bill responds by saying that since Flaming Gorge is in the area, he should stop by Dinosaur National Monument --- they have a brand new Visitor Center and his son went there and loved it. Well the Visitor Center isn’t nearly completed yet, but this is Big Love’s fifth season and its last. It will be off the air by the time we open. So thanks for the plug, even if it is a tad early. Demolition of the two story Rotunda building. Tearing down the long, curving entrance ramp. Pulling the 28,000 pound crane out through the windowless east side of the building. Raising and lowering the existing steel beams to make the south wall level (for the first time in 50 years). Yes, we have witnessed some amazing events during the Quarry Visitor Center project. However, we just had a notable moment, notable not because of its spectacle, but rather because it simply marks the beginning of a significant new phase in the project. 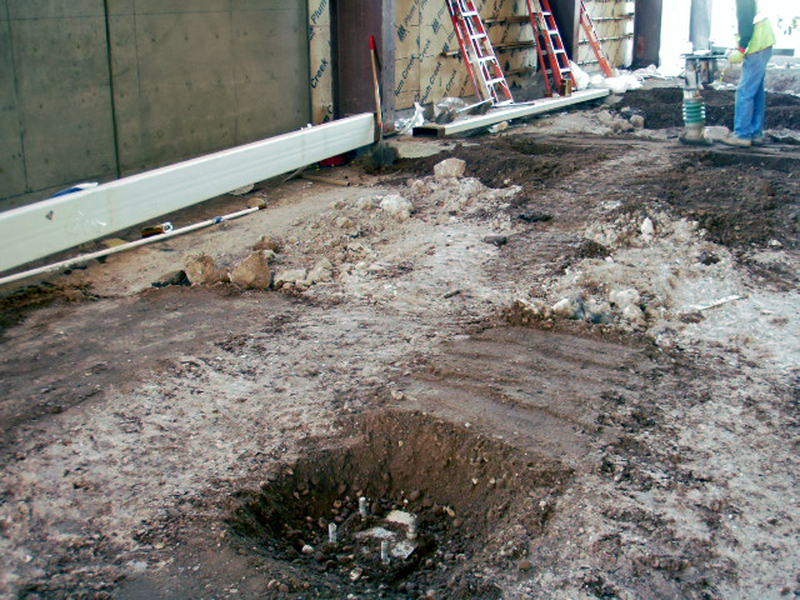 A level dirt floor and ramp footer. 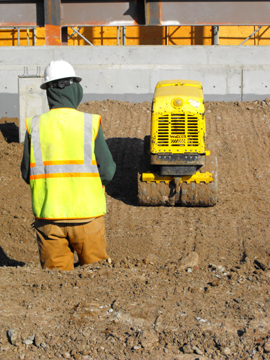 In the distance a construction worker compacts soil. 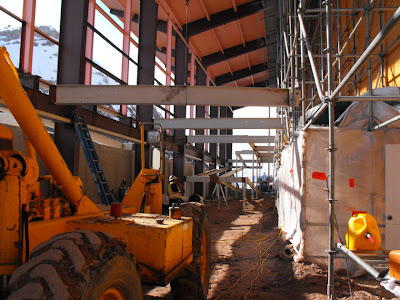 Recently the crews have started to put up the steel for the indoor ramp. The old QVC had a set of stairs connecting the upper and lower galleries inside the building. This was part of the handicap access problem of that building --- an outside ramp too steep and only stairs inside. The new QVC, with its properly sloped ramps, will allow everyone to pass through the building and get to any part of the exhibits. With the dirt inside the skeleton of the QVC leveled, the ramp has started to go up --- footers were poured, steel beams anchored to the footers, and the framework welded to the steel beams of the building itself. This might be easily passed over as just another step in the project, but it is notable because for the first time we are building something inside the QVC. This is a moment that seemed would never arrive. We can finally see the finish line on the horizon --- although the snow and ground fog makes it a bit hard to pick out. Many monsters never really go away. For example, over a series of three films the Creature from the Black Lagoon returned over and over, and became more human in looks and biology with each new movie. Probably the greatest monster resurrection of all time is that of Lieutenant Ellen Ripley and the Aliens from the planet Acheron. After plunging into a processing vat of molten metal on the planet Fiorina 'Fury' 161, a foundry facility and penal colony in Aliens 3, both she and the monsters are cloned and brought back to life aboard the spaceship USM Auriga some 200 years later in Alien Resurrection. 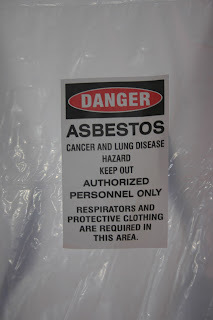 Well, the Quarry Visitor Center is haunted by a number of engineering and construction monsters, but the one that never seems to go away is hazardous material abatement. Extensive abatement was needed for fiberglass, asbestos, and lead paint before the demolition of the office wing, rotunda, and exhibit areas could even begin in the old QVC (see my previous posts Hidden Dangers [Wednesday, April 21, 2010] and Asbestos [Friday, June 18, 2010]). Lead paint abatement continues to be required whenever beams are to be cut or steel parts welded together and most of the remaining steel beams in the building are coated by that lead rich 1950s and 1960s paint. And with construction moving forward and steel finally being put up, abatement has again raised its head. 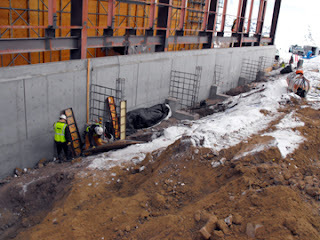 Extensive welding is being done as part of the building of the entrance ramp and another ramp inside the building that connects the upper and lower galleries. 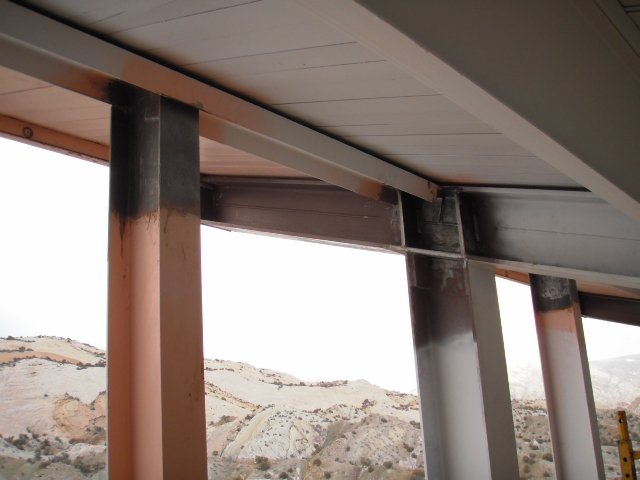 Both structures need to be welded to lead paint covered steel beams. The beams of the north wall of the Quarry Visitor Center --- a place where the sun never shines. Unexpectedly, recently completed new studies suggest that the north wall of the building needs additional reinforcement, so steel plates and connecting beams will be welded to each of the 10 beams in that part of the structure. 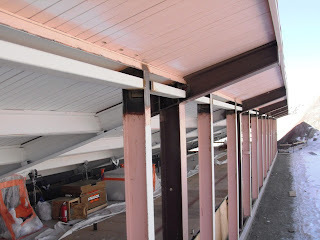 And, of course, those beams are coated in that lovely pink and brown lead based paint. 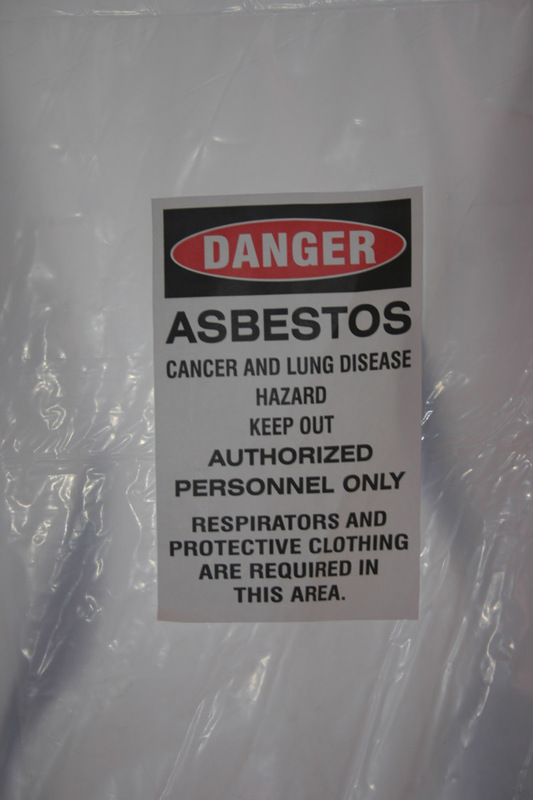 To further complicate matters the lead abatement is being done using chemical strippers. When the chemicals are applied the paint softens, separates from the steel, and can be scrapped in large soft sheets into plastic bags. Well that’s how it works most of the time. But the effectiveness of the chemical strippers is temperature dependent. And right now the temperature is not always cooperative. When the sun is shining directly on the beams the chemicals work fine. However, once in the shade they are less effective. As the temperatures plunge, they may not work at all. 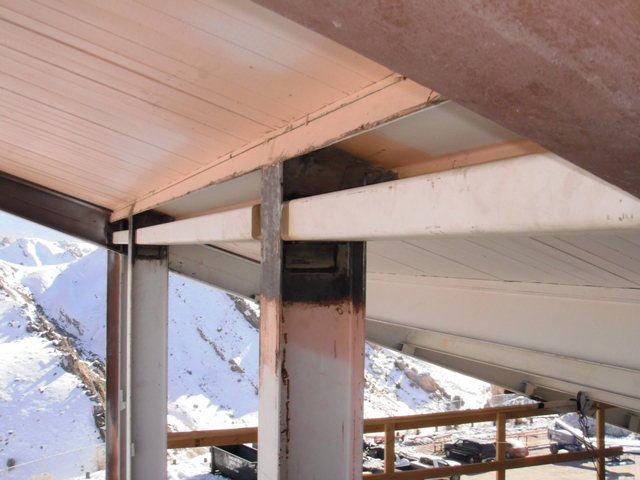 With February being the most disagreeable month here, as far as sub-zero temperatures are involved, the abatement can take longer than hoped for. 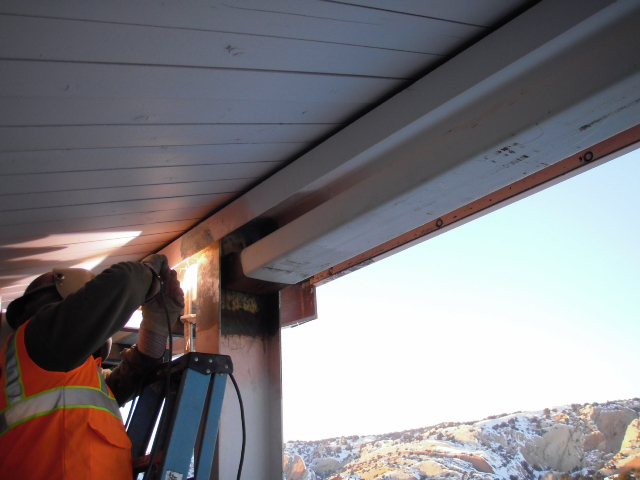 And the need for unexpected abatement on the north side, where there is little direct sunlight, promises further frustration and some slowing down in the schedule. However, this is in keeping with the history of the QVC project ---- many surprises, few of them pleasant. 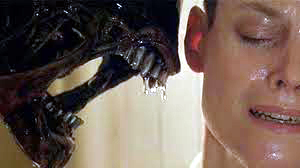 Photos: NPS (with the obvious exception of Ripley and her Alien inquisitor). 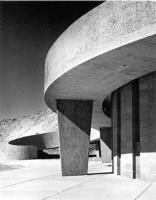 One of the best known architectural elements of the previous Quarry Visitor Center was the snake-like entrance ramp running from the parking lot, sensuously wrapping itself along the outside of the Rotunda, and providing an entrance to the second floor of the building. This was a clever design for when entering the building the visitor was struck dumb by the spectacular overview of the entire cliff face. It was a great piece of drama and quite effective. Visitors came expecting to see mounted skeletons and instead were confronted by a vision that both awed and raised questions as to how this mass of bones come to be. Being built in 1958, the ramp predated handicap access issues and code. That is plainly seen in photos of the original ramp, which shows a short series of steps at its base. 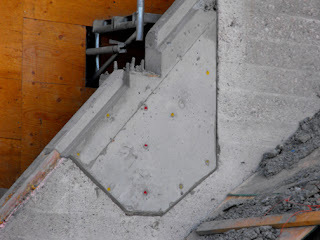 At some later date the stairs were removed and the bottom of the ramp sloped. To visitors the ramp was deceptive. It appeared to be handicap access but the slope was much too steep and unsafe for wheelchairs. With the design of the new QVC we wanted to retain that original majestic entrance and introduction to the cliff. But with no Rotunda to wrap around, a different solution was needed. The new design calls for a long ramp running along the south side of the building, with one switchback, to bring it to the second floor. While the ramp seems long, it is well within requirements for handicap access. After the concrete south wall was poured and completed, its foundation was still exposed in a deep trench well below ground level. So the first step was to fill in the trench and then slope it up to the south wall. The soil fill needed to be solid, so after filling the trench the soil was compacted. One tool was the standard handheld powered compactor. That’s a pretty jarring piece of equipment to use, but it allows one to work right up to the foundation. 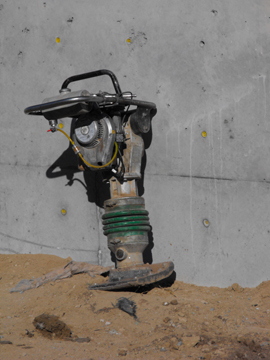 A second piece of equipment was a larger, more powerful, remotely controlled compactor that was run by an operator using a control box with a joystick. This machine moved back and forth, compacting wider swaths of the soil. 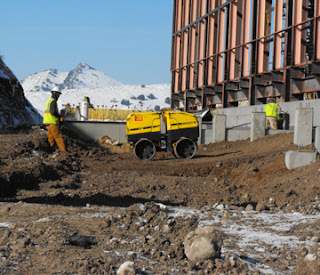 With the soil compacted ramp construction could begin. The components were brought to the site. 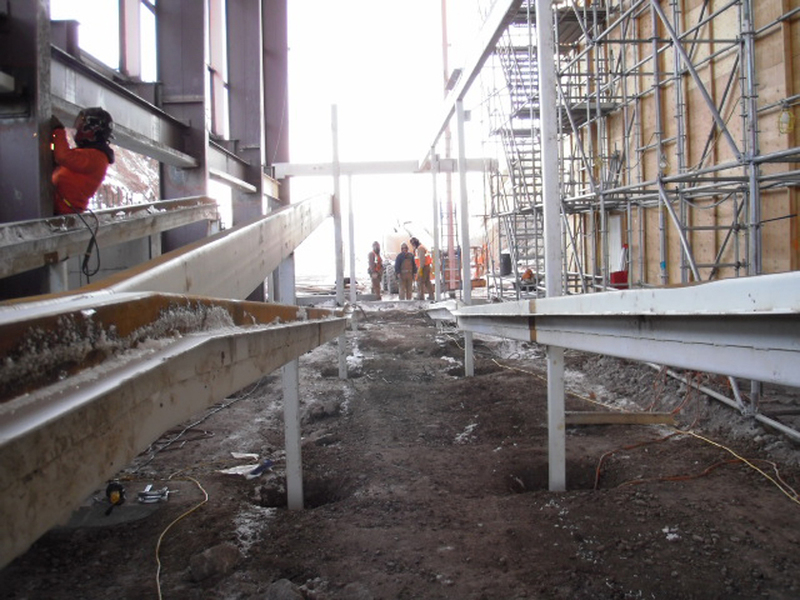 At present the frame of the upper part of the ramp has been built, installed on the footings, and welded into place. The lower part will be installed later in construction, as vehicles are still driving and working over the spot where that ramp segment will go. Yes, I realize that this is a ramp and not a stairway, but given the opacity of Led Zeppelin’s song lyrics, I feel my title is not too much of a stretch.